Donate to AGE UP on May 9th for GiveBIG. Have you signed up to boycott the AUDL? Have you signed a letter saying you are for Gender Equity? I have technically boycotted the AUDL this year. I haven’t gone to a game, I’m not participating, and I agree with a lot of what has been said around why boycotting is a good idea. But I also have never participated or wanted to participate, and I think I have only ever been to one game with a free ticket. So maybe I have always boycotted the AUDL. I am pro gender equity, I am a woman who plays, and I would like to see more women and girls competing. But I find myself asking, what have I truly done to work on the goal of having more women seen? And when we are talking about more women competing, who are we talking about? Who are we leaving out? Ultimate is still a pay-to-play sport for almost everyone. The college division is the host for a huge portion of ultimate players, but you have to get accepted, pay for school, pay for ultimate, and still get amazing grades and if you live at home with your family, help there too. I was first part of the college women’s division in 2005 and once I graduated I started coaching. Since then the division has exploded with teams and players. Right now, to my knowledge, youth ultimate and the AUDL are the lowest cost to play and compete. So now I have a lot of conflicting ideas, as an adult there are really not many opportunities for people to play that are not really expensive. The AUDL doesn’t really have a sustainable, fully developed place for women but it does have opportunities for men who would not be able to pay to compete at a high-level otherwise. The college and club division have a space for women to play but not if you can’t afford it. Additionally, the college and club division is much more white than it is male. When I think about intersectionality and all of the different ways one can be systematically oppressed, it feels like we have to choose who is more important. It would be easiest to focus on gender equity at the expense of access around race or class. So now what can I do, what can we do? Here is a first draft list, I am sure there is much much more. I am not the first one to think of any of these ideas, and I might have forgotten something really important. This is a list compiled by a lot of time talking, listening, reading, being vulnerable and making mistakes. Engage with people that have perspectives that you don’t understand. Read, read, read… It is not the job of others to education you. To start, I would recommend “So You Want to Talk About Race” by Ijeoma Oluo. Next, read “Elements of White Middle-Class Dominant Culture”. How does this apply to the the leadership styles that are being modeled on your team? How does this apply to what we define is good SOTG? Acknowledge your privilege and power. What lens do you view situations through? Accept that there are times when you don’t need to be involved. Talk to USAU, AUDL, club team leadership, and universities. Do their policies create barriers to inclusion? Question the ways that you think, consider the sources of your facts, examine your realities. Don’t allow yourself to become so afraid of making a mistake, that you end up doing nothing. Listen to what others are telling you. For example, if someone of color says it’s about race, it’s about race. Don’t become complacent. Recognize that these concepts are areas of continual growth. Go to Age Up’s Event: Power, Privilege, and Plastic today, May 3rd at 6:30. Like and follow Age Up on Facebook and Twitter, and tell your friends! DONATE to AGE UP on May 9th and monthly, especially during the LAST GiveBIG event sponsored by Seattle Foundation on May 9th. 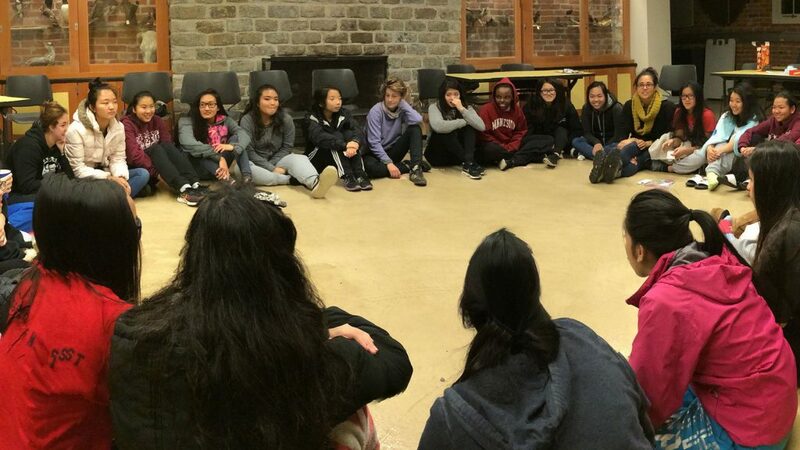 AGE UP is a program that is already doing a ton of work with with a commitment to bring anti-oppression analysis in leadership opportunities and access to young people in ultimate, specifically girls of color living in South Seattle. As a coach and a player, I have seen the countless ways that AGE UP has broadened the reach of our sport, started and continued conversations on race and class, and provided access to leadership opportunities for youth. This is the last year of Seattle Foundations GiveBIG, and AGE UP is looking to use this as an opportunity to reach two goals: 1) Building sustainable funding to provide full-time positions for staff; 2) Paying AGE UP staff and Southend coaches a livable wage. As an individual, your donation can help us take a big step in that direction. And as a team, we can play an important role in spreading the word and advocating for their work. 500 individual donors (each donor entry is a chance for us to win a $2,500 raffle prize). $60,000 with our generous community match of $30,000. Lastly, I wanted to say thanks to Hana Kawai and Aimie Kawai for letting me use some of their thoughts. Riot for giving me a platform to speak on. Bailey Zahniser for being someone I can talk to about thoughts and feelings with.